One positive result of the hot humid summer is peaches are plentiful and have been creatively included in many seasonal restaurant menus alongside savory ingredients. Roasted, pickled, grilled and marinated, the peach is getting a moment of fame beyond pie, tart and shortcake. Just the other day on the TV show the Chew, Mario Batali made a dry rubbed skirt steak salad with peaches, cucumber and basil. Martha Stewart has a recipe for peach gazpacho, garnished with red pepper and avocado. 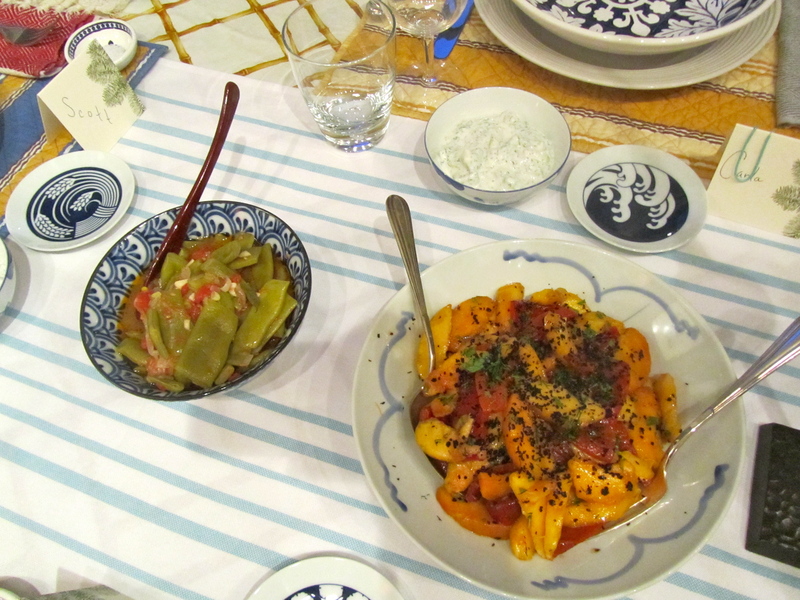 At the beginning of peach season for a Turkish dinner party I made a mezze recipe with peaches and grilled red peppers from Ghillie Basan’s, Classic Turkish Cooking. The dressing for the salad consists of olive oil, pomegranate juice, fresh mint and dill leaves with a sprinkling of kirmizi biber. Kirmizi biber is a Turkish smoked red pepper made with a mild red pepper crushed, rubbed in olive oil and roasted in the oven or a pan over a high flame. It is often used as a garnish on the Turkish pasta manti, sprinkled on top of the yogurt sauce. It is similar to Spanish smoked pimento but with a little less sweetness and a coarser texture. It is a great way to finish a dish, the dark colored flakes make a dramatic presentation. The mezze dish was a hit and would also make a great companion with roast pork or grilled fish. Here is my summer recipe inspired by a peachy summer, fruit as a savory component and kirmizi biber….. I use a stove top cast iron grill, Manhattan apt style but if you have the real thing use it! Slice a medium to large eggplant in ¾ in slices. 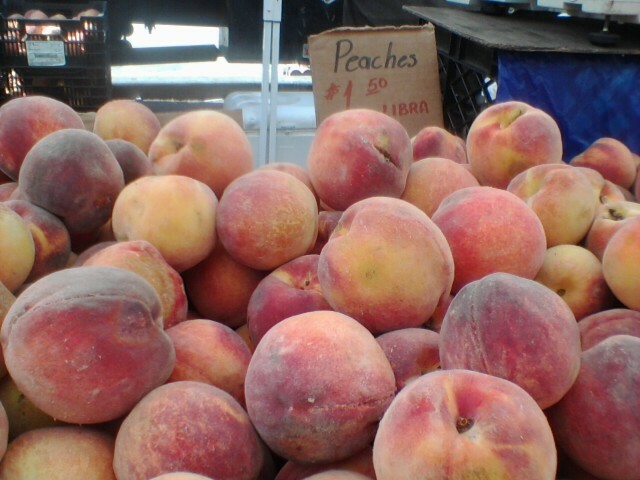 Cut the peaches in half, pit, rub with lemon juice and either half or slice depending on how big the peach is. A large peach you can get four slices. Roast the red peppers on the gas flame on your stove or under your broiler, put in a plastic bag to sweat for 15 minutes then remove the skin, rinse, dry, cut into one inch strips and toss with olive oil and salt. Brush the eggplant slices with olive oil and grill, remove and sprinkle with salt. Generously brush the peaches with olive oil and grill, grill enough to make marks. 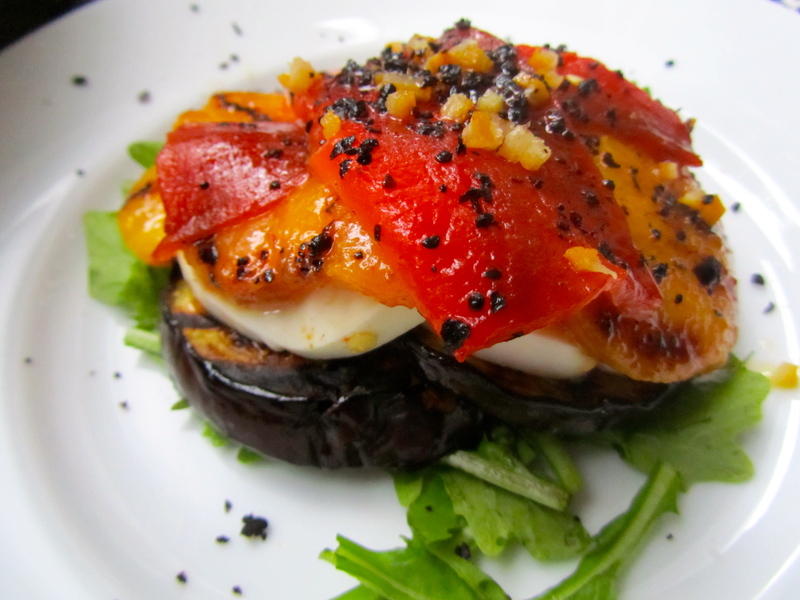 Layer, two slices of eggplant overlap, then layer a couple slices of mozzarella, then a layer of grilled peaches, a criss-cross of roasted red pepper. Sprinkle with a good quality olive oil, finely chopped preserved lemon and a sprinkling of sea salt and kirmizi biber. I like to add a few arugula leaves on the bottom for color. It is best to assemble when warm so the mozzarella gets a little soft. Replacing the red pepper with fresh poblano chili’s would make a nice variation to play off a little heat against the peaches.